Large pig abandoned at The Las Vegas Farm on Saturday night. The owner of the farm has no money or space for it. LAS VEGAS (KTNV) — A large pig was abandoned at The Las Vegas Farm Saturday night. The owners told 13 Action News the massive pig was found tied to a pole and that it's in poor condition. Sharon Linsenbart has owned the farm on Grand Teton Drive in northwest Las Vegas for at least 50 years. "He is sunburnt terribly which can grow into abscesses, his feet have not been cared for and he is so tender. Someone already chopped off his feet. Both his ears are so abscessed. We need to get him to the vet,” said Linsenbart. She was upset upon the discovery because someone decided to dump the responsibility of a 450-pound pig on her. The pig was named Homer. "I’m going to have to care for this animal 15 to 20 years!" said Linsenbart. The Las Vegas Farm is known for rescuing animals but an approval is required before the animal is taken in. “That doesn't mean that every farm animal that comes my way I can rescue. I have to pick and choose who is most in need, who I can afford, who I have the space for." The farmer also said someone called a few weeks ago asking if she could rescue "take in" a pig. She declined since her farm has no extra space and is on a tight budget. 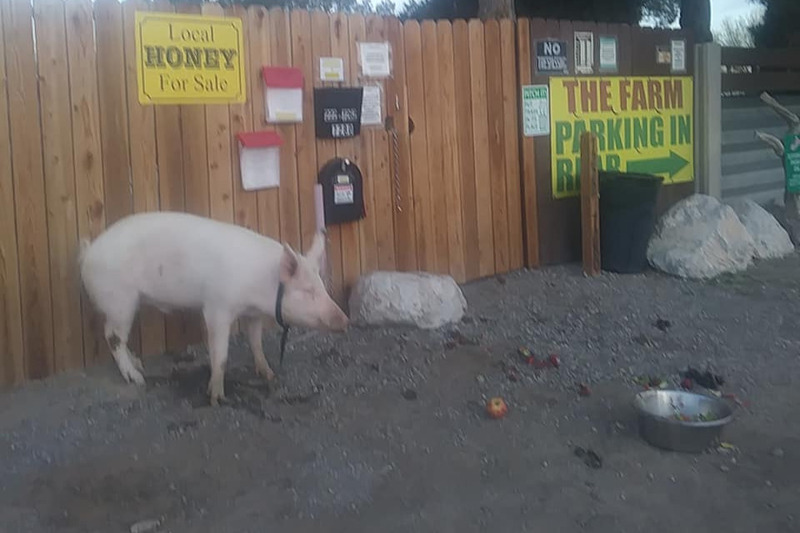 Linsenbardt called several pig sanctuaries and animal control in Las Vegas but was told there is no room for Homer since they’re also at capacity. Regardless of the challenges, Homer's new home will be The Las Vegas Farm. "A habitat alone is going to cost me anywhere between $10,000 and $15,000. The USDA inspection will demand of me [it has] a non-permeable top. They have to have a place to get out of the weather, a place to get out of the sun, they have to have an automatic water source that doesn't get contaminated with ducks. They got to have so much," said Linsenbardt. Linsenbardt told 13 Action News she had stopped accepting pigs because she has too many and already cares for a farm pig named Willow, who weighs nearly 1,000 pounds. "This will be Homer in a few years, exactly. They get massive. You can't put them in any pen," said Linsenbardt. A GoFundMe account has been set up to help with the costs.